Prototype: Three (3) different design German Federal Railroad (DB) express train passenger cars, for the express train IC 611 "Gutenberg" from Hamburg-Altona via Cologne and Stuttgart to Munich. 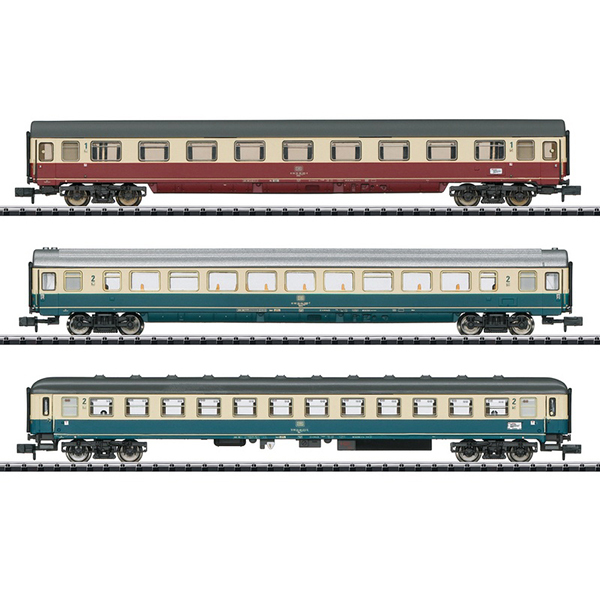 One (1) type Avmz 111.1 compartment car, 1st class. One (1) type Bm 235 compartment car, 2nd class. One (1) type Bpmz 291.3 open seating car, 2nd class. The cars look as they did in 1984. Model: The cars have close coupler mechanisms. They also have built-in LED interior lighting. Total length over the buffers 495 mm / 19-1/2". Decal set for "IC Kurierdienst" (IC courier service) included.